A recent startup in Indian gadget market, IBall has launched a tablet iBall 3G Q7271-IPS20 in India. This tablet supports dual sim with 3G support and voice calling feature. iBall 3G Q7271-IPS20 Tablet best price in India is around 3000. To help you decide whether to buy it, here are detailed iBall 3G Q7271-IPS20 Tablet specifications and review. iBall 3G Q7271-IPS20 houses a trendy and sleek design. It incorporates a 1.3 GHz quad-core Cortex A-7 processor. The CPU is accompanied by 1 GB of DDR3 RAM. The 7 inch tablet has an inbuilt memory of 8 GB, expandable upto 32 GB by a micro sd card. The iBall 3G Q7271-IPS20 battery is a 3000 mAh Li-Po battery. iBall 3G Q7271-IPS20 Tablet runs on the latest Android Kit Kat v4.4. The tablet includes wi-fi and dual sim support, voice calling and video calling feature too. iBall 3G Q7271-IPS20 has wireless FM Radio. iBall 3G Q7271-IPS20 Tablet sports a 2 MP primary camera and has no flash. The camera resolution is better than its rivals in the segment. Daylight pictures are a nice view with fine details. The camera is capable of video recording too. There is a 0.3 MP front camera for selfie and video calling. The 7 inch display of the tablet is an LCD display with a resolution of 1024x600 pixels and a multipoint capacitive touchscreen. The display is a good to watch and provides nice daylight visibility. You can buy iBall 3G Q7271-IPS20 Tablet online in India for around 3000 . 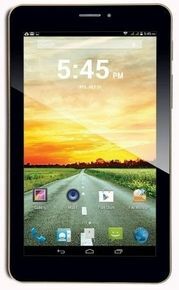 For detailed iBall 3G Q7271-IPS20 Tablet online price comparison, have a look at various online shopping websites like amazon, flipkart, etc. The processing speed is swift but multitasking experience is a bit sloppy. Great Performer in a less affordable price. Great specifications in a budget price. Good to buy. Smart to choose. Stylish gold coloured, ultra slim and sleek. Thanks iBall for making this a great tab.